What is Easy Church Tools Connect Manage? Easy Church Tools Connect Manage is a cloud-based management kit for churches, including Connect Manage that allows churches to manage and administer their operations more efficiently. The CMS is a comprehensive online membership solution for churches that is easy to use and built from the ground up keeping flexibility and simplicity in mind. The CMS provides full database capabilities with family linking, notes, ministries and more and helps connect churches with members and newcomers. Not only the software requires very little learning curve, it also does not require lengthy installation processes and additional hardware as it is 100 percent web-based. Users can login from anywhere using any device and start using the software as it’s fully compatible with all major browsers and operating systems. The congregation management features of the software allow churches to easily import contacts without any additional cost from various file formats, including CSV and Microsoft Excel. Users can quickly view important statistics about their church, including total members, families, adults, children, active people in small groups and ministries and so on. The system makes it easier to manage and sort people and allows users to view filtered lists, including recently added members. The software automatically reminds users of important upcoming events through the Important Dates page that provides a complete list of upcoming anniversaries, birthdays etc. for each member. The connection process of incoming-visitors is easily trackable and the software allows customizing steps for a successful and enhanced welcoming process. The powerful and advanced data profiling features help churches maintain important demographic data for each person. It allows users to easily access information, including email addresses, contact numbers, school names and graduation dates. Photos can be added to profiles, while users can also perform basic image manipulations right from within the software. Attendance tracking features allow users to view each event based on customizable orders, while events can easily be tracked by their categories and sub categories. Creating one-time or recurring events is also easy in the attendance system as users just need to enter an event once. Powerful search features allow users to search and sort information using a variety of triggers such as gender, age and targeted keywords. All the data is stored in professionally managed servers and secured with 256-bit SSL certificates, while secure data backups are also ensured on an hourly basis. 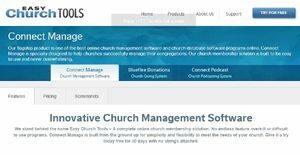 If you are interested in Easy Church Tools Connect Manage it could also be beneficial to check out other subcategories of Best Church Management Software gathered in our database of B2B software reviews. Each enterprise has different wants and needs an application that can be customized for their size, kind of workers and clients, and the specific industry they are in. For these reasons, no software can offer perfect features off-the-shelf. When you look for a software system, first be sure what you want it for. Read some Easy Church Tools Connect Manage reviews and ask yourself do you desire basic features or do you require complex features? Are there any industry-specific tools that you are searching for? Get the answers to these questions to aid your search. There are plenty of factors that you need to consider and these include your budget, specific business requirements, your company size, integration requirements etc. Take your time, use a few free trials, and finally select the platform that offers all that you want to improve your firm competence and productivity. How Much Does Easy Church Tools Connect Manage Cost? We realize that when you make a decision to buy Church Management Software it’s important not only to see how experts evaluate it in their reviews, but also to find out if the real people and companies that buy it are actually satisfied with the product. That’s why we’ve created our behavior-based Customer Satisfaction Algorithm™ that gathers customer reviews, comments and Easy Church Tools Connect Manage reviews across a wide range of social media sites. The data is then presented in an easy to digest form showing how many people had positive and negative experience with Easy Church Tools Connect Manage. With that information at hand you should be equipped to make an informed buying decision that you won’t regret. What are Easy Church Tools Connect Manage pricing details? What integrations are available for Easy Church Tools Connect Manage?